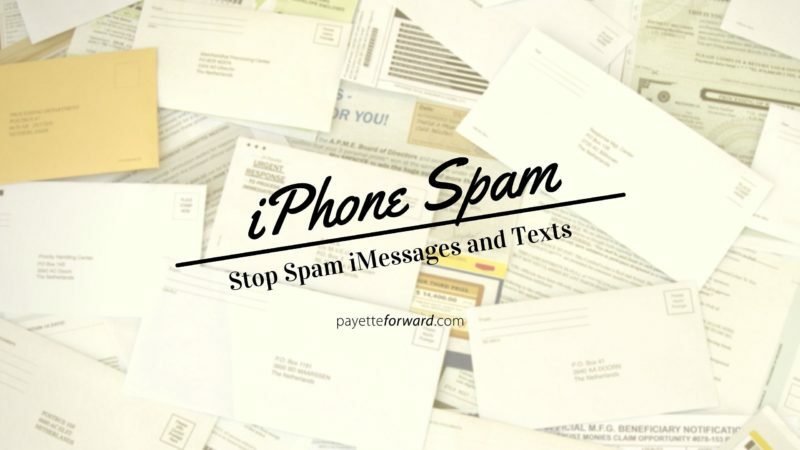 You are at:Home»iPhone»Spam On My iPhone: Stop Spam iMessages And Texts! First it was in the mail, then came the phone calls, and now it’s on your iPhone: Spam iMessages and text messages are showing up all the time. Spam is annoying, but it can be dangerous, too. The websites that spam iMessages and texts link to are designed to make the spammer a commission on a sale or, more frequently, to steal that person’s credit card number and other personal information. In this article, I’ll show you how to recognize iMessage spam by looking at a real-world example (it’s not always easy) and how to stop getting spam iMessages and texts on your iPhone. There’s a tried-and-true formula spammers have used for years, and people still fall for it every day. There’s a great deal on something, but only for a limited time, so you’d better buy it right now! There’s a link to a website where you can get the deal, and the link usually looks legitimate. But that’s how they get you. Spammers do everything they can to get you to click on that link. A few years ago, the only text messages we received were from our family members and friends. Nowadays, we receive texts from companies, too. Facebook, Twitter, Apple, Google, and other companies use text messages as a way to verify your identity and send you updates. McDonalds runs contests where the user texts an entry code to a phone number and finds out if they’ve won by getting a text in response. Never click a link inside an iMessage or text message if you don’t recognize the sender. It’s absolutely OK to click on links sent by our family and friends, as long as they don’t look suspicious. If you already have, I’ll explain what to do later in this article. Apple is the only company that will send you iMessages. If you receive an iMessage from any other company, it’s spam. iMessage is Apple’s messaging service, and it only works with Apple products. If you’re not sure whether the message you received is an iMessage or a regular text message, look in the box where you type your reply at the bottom of the screen. That box will say iMessage or Text Message, according to the type of message you received. 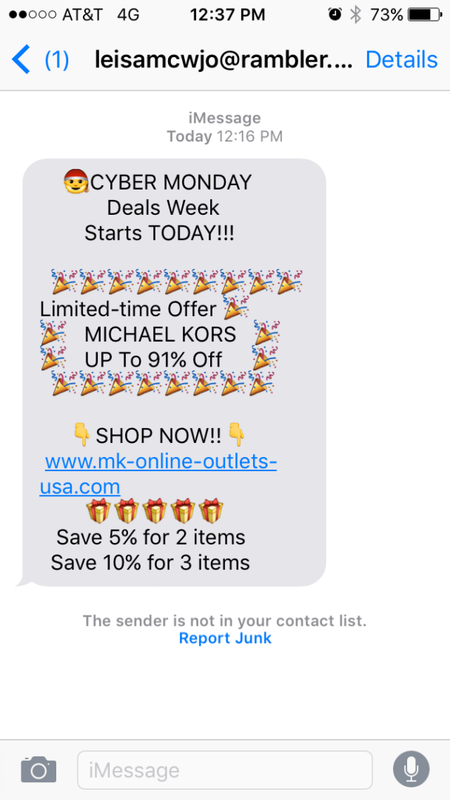 My friend Nick suggested I write an article about iPhone spam after he received a spam iMessage from “Michael Kors”. When I saw it, I realized how good spammers have gotten in the last few years, so I decided to take his advice. We’ll use Nick’s iMessage to look at a real-world example of iPhone spam. The message itself is visually engaging and uses emojis to draw the reader’s attention away from the sender’s email address, which is the most obvious giveaway it’s spam. However, iMessages you receive from email addresses aren’t necessarily spam. iPods and iPads that don’t have phone numbers attached to their Apple IDs can send iMessages from the user’s email address, and that’s perfectly legitimate. The spammer provides a lot of details. After all, why would a spammer take the time to be so specific about the amount of savings and discounts for buying multiple items? It’s distracting and the additional details make the message appear to be legitimate. Website addresses (also known as domain names) that are similar to a real company are one of the most effective tools spammers use to trick people into giving up their credit card information. 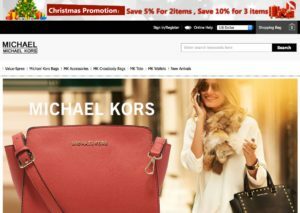 In this example, www.mk-online-outlets-usa.com (it’s not a link because you shouldn’t go there) masquerades as a Michael Kors outlet site. Keep in mind that anyone can register a domain name, even if it uses a company name. You could register michaelkorschristmasdeals.com right now for $12. You Can Tell Which Website Is Fake, Right? I visited the spammer’s website and was surprised by what I found: A high-quality, functional website that made me stop for a second and think, “Maybe I was wrong about this.” Until I did some more research. Every domain name (including payetteforward.com) is registered in a worldwide WHOIS database. This database is free to access and provides details about who owns the domain name and where it was registered. 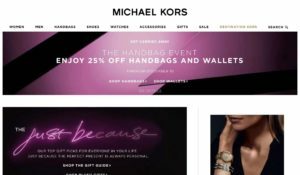 The websites may be hard to tell apart by looking at them, but let’s take a look at the WHOIS records for michaelkors.com and mk-online-outlets-usa.com (click to see the WHOIS records, not visit the spammer’s website). The owner of michaelkors.com is listed as “Michael Kors, LLC” and the domain was registered by “NETWORK SOLUTIONS, LLC”. The owner of mk-online-outlets-usa.com is listed as “yiyi zhang” and the domain was registered by “HICHINA ZHICHENG TECHNOLOGY LTD”. By looking at the WHOIS records of mk-online-outlets-usa.com, it’s very obvious that mk-online-outlets-usa.com is not a legitimate website. I Already Clicked On A Link. What Do I Do? I recommend that you delete all website data from your iPhone if you’ve already clicked on a spam link. This isn’t going to delete your bookmarks – it will only delete your browser history and the little files (called cookies) that store data for websites. 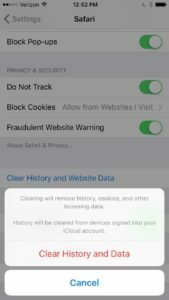 When you delete website data, you’ll be cutting all possible ties from your iPhone to the website you visited. Go to Settings -> Safari, scroll to the bottom, tap on Clear History and Website Data, and tap Clear History and Data. Even if you already clicked on a link, you’ll probably be OK as long as you didn’t enter any personal information. If you bought something through a link you received in a spam iMessage or text, I recommend you get in touch with your credit card company right away. How Do I Stop Getting Spam On My iPhone? Whenever you receive a message from an email address or phone number that’s not in your contact list, your iPhone will display “This sender is not in your contact list. Report Junk” underneath the message. Tap on the blue text that says Report Junk to delete the message from your iPhone and send it to Apple. Did you know you can separate the Messages app into two sections, one for Contacts & SMS and one for Unknown Senders? It’s an easy, effective way to separate the good iMessages and texts from potential spam. Go to Settings -> Messages and tap the switch to the right of Filter Unknown Senders to turn it on. Blocking a spammer’s email address or phone number is a fool-proof way to be sure you never hear from them again. When you block a contact on your iPhone, you block all communication from that person’s phone number and email address, including phone calls, iMessages, text messages, and FaceTime. My article about how to block unwanted calls on an iPhone explains how to do it, because phone calls, iMessages, and text messages are all blocked the same way. Spammers are always coming up with new tricks to fool consumers. 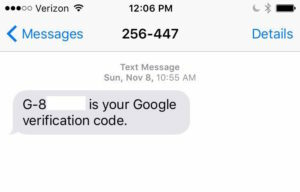 The iMessage and text message spam we’re receiving on our iPhones is just the latest ploy that spammers are using. If I may offer one piece of advice when dealing with iPhone spam, it’s simply to be careful. Trust your gut if a deal sounds too good to be true. In this article, we talked about the tricks spammers use to make their iMessages look legitimate and the steps you can take to stop getting spam on your iPhone. 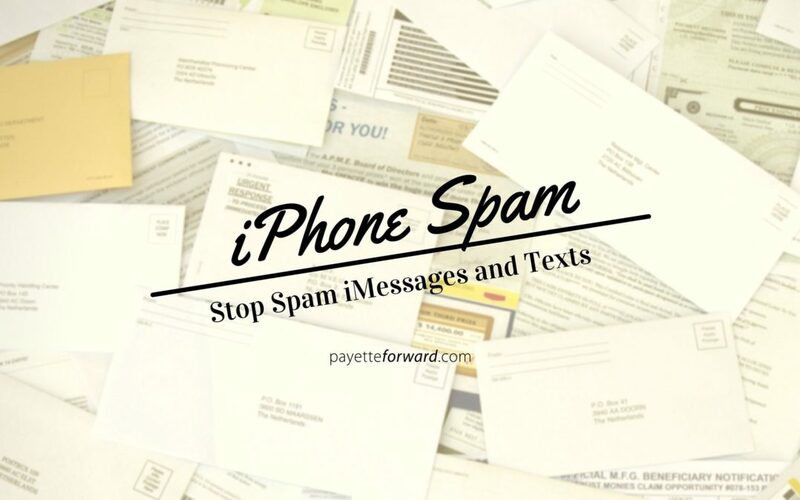 I’m interested to hear about your experiences with spam on your iPhone in the comments section below. Junk mail photo by Judith E. Bell and licensed under CC BY-SA 2.0. Previous ArticleMy Apple ID Is Disabled! Here’s The Real Fix. Next Article How Do I Change My Apple ID On My iPhone? The Fix!